Earlier this year Susan was delighted to accept an invitation to display and demonstrate her work at a unique event being organised jointly by the Forestry Commission and Lincolnshire Limewoods Project. 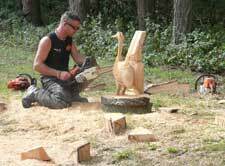 The first ever Lincolnshire Firewood Fair and Auction took place on Sunday 6th September at Baumber near Horncastle. The aim was to promote the use of firewood as a renewable resource and encourage landowners to manage their woods. As well as getting people to think green, the organisers were keen to make it an enjoyable day out for all the family. 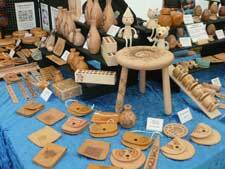 It was felt that wood and fire related crafts would complement the theme admirably and Susan's pyrography work proved a popular attraction alongside that of a local woodturner and basket weaver. With over thirty exhibitors there was plenty to see and do. A variety of firewood and forestry equipment were showcased, while displays of chainsaw sculpture, tree climbing, horse logging and even firewood cutting races added to the fun. The event proved a huge success with attendance figures far exceeding expectations. Here in Lincolnshire we are extremely fortunate to have the greatest concentration of ancient woods containing small leaved lime trees in the country. Ancient woodlands are extremely important for wildlife as they contain more plants and animals than modern woodlands and are impossible to replace. A partnership of local and national organisations, including the Forestry Commission and Lincolnshire Limewoods Project who organised the above event, are working together to improve the woods. In order to remain valuable for wildlife and people, the woods have to be managed and traditional coppicing has been re-introduced. This is the regular cutting of trees back to their stumps to provide a steady supply of poles and firewood. The spaces and glades created encourage a wider variety of plants which is vital for butterflies and birds. Susan visits the Lincolnshire Limewoods area on a regular basis throughout the year where the changing seasons and the local flora and fauna provide a rich source of inspiration for her work. For more information on the Lincolnshire Limewoods Project please visit www.limewoods.co.uk . Further details on the Lincolnshire Firewood Fair & Auction, including the date and location of the current year's event, can be found at www.lincolnshirefirewoodfair.co.uk .